“A few years ago I was quite ill for an entire summer. The only thing that brought relief seemed to be a hot bath. We have a large garden jacuzzi tub in our master bathroom. I took a bath a few times a day (sometimes more) for several months. Thankfully, my health returned but that winter I realized that my illness had taken it's toll on my drain field. It would no longer receive the liquids being pumped from my septic tank. I tried to go easy on our water usage and rest it but all of the local experts told me that once a drain field fails there is no fixing it. We were mortified to have our waste flowing out into our front driveway not to mention the obvious health risks. I admit I was desperate when I stumbled onto Bio-Safe One, Inc. Septic Products. But the explanation of how it works made sense to me. I knew that a bio mat of sorts had built up due to the high volume of liquid and the Bio-112 and the other products Chris told us about were supposed to eat through the sludge. So, we looked at our options which included spending 30K on an adjoining lot so we could put in a new drain field. We decided to take the 4K risk and try the product first. The first few months were hard because I didn't think I was seeing a difference and I had just spent a large sum of money. Chris tried to reassure me but I was nervous. Then, we altered the PVC pipes at the end of the drain field to accept the product directly (we cut off the end and added an elbow and a short piece of pipe and a removable cap). Two weeks later we began to see results. It was like a miracle but I was still holding my breath. A few months later we saw no evidence of any overflow and the rocks in the end ports were dry whenever I checked. It has been a year now and the results have remained. I did alter some of the home cleaning products we used as per Chris' instructions. On three separate occasions when I went out to either check on the situation or to add product, the pump had just kicked on and the fluid was dispensing into the drain field and I was able to catch it on video. I attribute this to divine providence since I had no way of guessing when this would happen (also divine providence that my camera was right inside the door when I frantically ran in to find it). Anyway, the videos are obviously "home videos" but they show the amazing transformation. Because I have a small amount of left over product, I add some every few months just for fun. 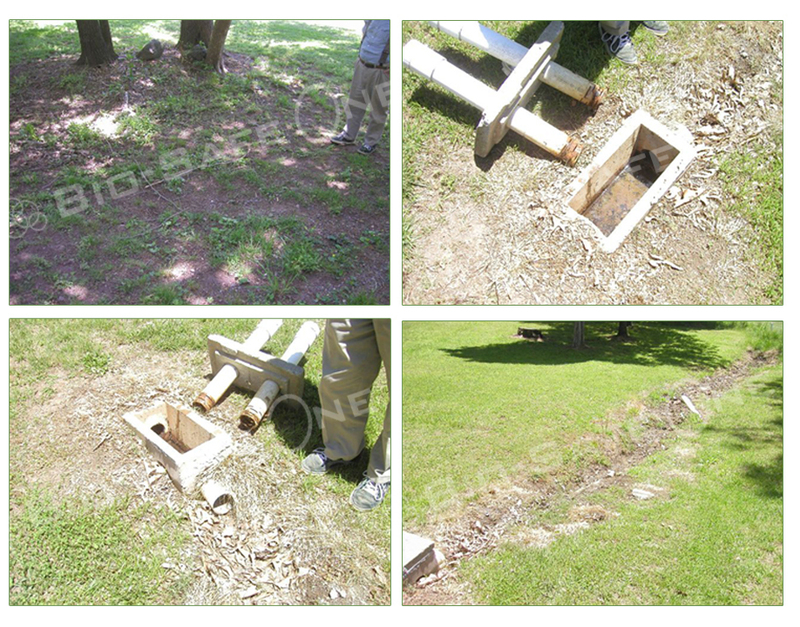 If you are reading this it is likely that you are having issues with your septic system. Let me be the first to say I am sorry. Grrrr...not fun! I hope in a few months your story ends as happily as mine did! “We owned a home located in a county island in Mesa AZ. When built in 1965 a septic system was installed. It has the regular sepitc tank and a dry well, ( 40 in in dia drilled 40 ft deep.) Our renters called that the system was backing up. We had the tank pumped and in a short time we would be called again. that up was tedious not to mention having to snake the sewer line manually or hiring someone so the bathrooms can be used normally again. “I ordered your products (5 gal. liquids,1 box boss powder) for both my septic systems. One system was already working so I just maintained it with a small portion of liquid. One year later when I called the septic guy to pump out the sludge, etc. that was "supposed" to be in the tank, there was none. The septic guy said he was pumping out only water-no scum debris, sludge etc. 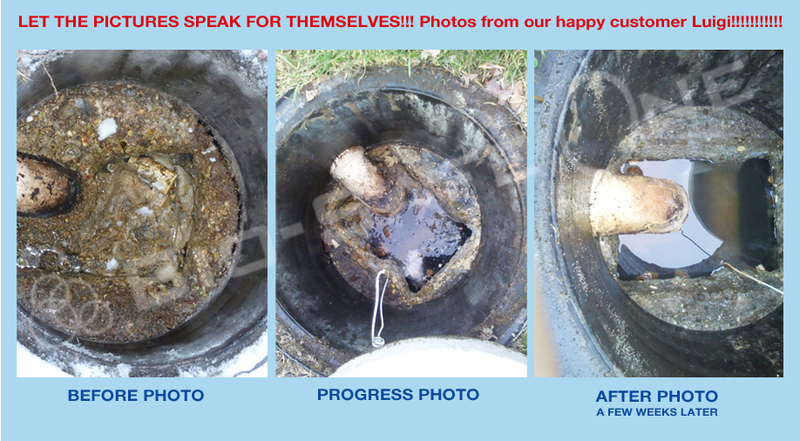 I know that bio-safe one enzymes cleaned up that septic tank and now the system is still working great. The other septic tank wasn't working for a long time, at least six years and overflowed on to the lawn with fowl smelling effluent. Not only was that part of my lawn stinking, it was like a swamp. It hampered the usage of the pool. This really needed to be cleaned up. So two weeks ago I had it pumped out, then I immediately shocked the septic tank with one case of boss and two gal. liquids. The system is not overflowing anymore and I have no more system backups. The foul odor is gone also. I rejuvenated my septic system and I am very pleased. I don't have to do any expensive repairs that could easily have cost fifteen thousand dollars or more. It was the bio-safe product that rescued my system. “This email is intended for Chris, who helped me with my purchases in the past. Chris, I have been using your product for about 2 years, now. I have used both the liquid and the dry powder packages. I used the liquid to seriously shock my septic system, and have maintained the system with the dry product. When I first started using the BioSafe treatments, my system was on the verge of a major disaster. (I knew I had to do something fast, as I could not afford a major plumbing bill - my husband is disabled, and our income is completely based on his disability.) The drains were getting very sluggish and making odd sounds. The run-off lines were getting blocked from material that would not break down. I noticed a continual odor in the yard. The liquid product cleared up all indications of trouble...in a matter of days!! All the visible lines were perfectly clean and clear. I was so pleasantly surprised. I have been using the dry product to keep my system running the way it should. I still check all the lines, but I never find a problem. I use extra product when I know I will have more people in my house that the usual family members. As a matter of fact, when Katrina hit New Orleans, I had 2 extra families that took refuge at my house. That was 8 extra people. But, thanks to BioSafe, my septic system was worry-free. Believe me, that really means a lot, especially during times when you really need all the household plumbing functioning properly! “OK Bill....I have waited for several months just to be sure what was going to happen before I wrote you to let you know if Bio-safe One corrected my septic problems. Drum roll please.....AND IT DID! You could push be over with a feather....your products actually work!! As you recall, my septic system was built in the early 70's. We purchased the house three years ago and I have had to have the septic pumped every year… Around July. Well… this year...around July the symptoms began...and I was desperate to have something done. My lot is VERY WOODED and on a steep grade and to top that, we can't locate the drain field...so any additional drain system would be VERY EXPENSIVE! I had spoken to a septic person and he said it would be very expensive to fix. I am so glad I stumbled upon your products on the web. To be honest...although you appeared to be an honest and very nice guy, I really thought you were going to take my money and I'd still have my problem to fix. I had tried other products from Lowe's and Home Depot....I might as well have burned the money for the good they did! But I followed your instructions on shocking my system and have begun my monthly maintenance. Here it is November and the gurgling has gone, the toilets all flush, the washing machine doesn't spill over onto the floor. My daughter even brought her boyfriend home from college and we did ALL THEIR LAUNDRY....and still the septic system shows no signs of stress. THANK YOU!! Bill… Please talk to your company about more visible advertising... this product needs to get into ever persons hands that has a septic tank. You have saved me thousands of dollars... money I can really use since my daughter just announced her engagement! Thanks again for your honesty, swift delivery and for being there to answer all my nit picky questions! Please feel free to use me as reference for others that may want to talk to someone who has used your products before they make the decision to purchase them. I'm just amazed and would love to share my success with others. "Hello Bio-Safe, I am truly amazed! I had a septic back-up at the tank, where about 6 inches of tank water rose up over the hatches and into a rectangular box frame around the hatch access. I and my family cut water usage drastically and saw some reduction in level of surface water, but it went right back up again as we started to use more water. I thought I was getting some leaching but not much at all. I was told by my pumping company who inspected my system that the leach field has failed and that I was facing huge repair costs of over 30 thousand dollars to replace leach field. I tried about 8 quarts of a product to revive failing fields called D-57 and I'm not sure of the manufacturer but I bought at my hardware store. I gave it 2-3 weeks to see if it would help but nothing happened. Then I found your website and read about your products. I called and talked to Bill who advised me and I placed the order for a box of BOSS powder and a several buckets of the BIO-112 liquid. I shocked my system with three of the 5 gallon pails of the liquid and about 4 bags of powder through the drains and toilets. I also put 6 bags directly into the D-box. I couldn't believe that in 24 hours all the overflow on the tank was drained and with showers and laundry and dishes being done there is no sign of overflow!!!!!!!!! I still continue to use Bio-112 and BOSS to further rejuvenate my leach field on a regular basis. I told Bill that if this worked I would write you my story so here it is! Thank you so much!" “Bill, I had to wait for a while to be sure your bugs are actually working. As you might recall, we could not find our septic tank, but at or near a distribution box, lots of foul smelling water was coming out of the ground and painting the ground where it flowed a nice shade of shiny black. The real problem was our "family essence" was flowing into No. 10 fairway which had only recently beautifully stretched over 500 yards behind our house. Our biohazard fountain science experiment was placed perfectly at the end of a 250 yard gentle hook - just over the cart path where the gentle ebony flow could make its way several yards down the path and finally into the fairway. The sort of hazard we provided was nowhere to be found in any rule book. Some members were beginning to rightfully complain that they couldn't decide how or where or even whether they were to get a free drop. There are some places where you really don't want to take a divot. Something had to be done.... Quick. We did discover a leaky toilet, but it was a slow leak and couldn't account for all the stuff coming out of the ground. We dumped a ton of your bugs, both liquid and powder, in each of our four toilets and waited two days. After two days, the water stopped flowing out of the ground and the soil around the erstwhile fountain became much drier. We went to the beach for a week, and when we returned, the ground had just about completely dried. In another week, water began very slowly coming out of the proper chlorinated overflow at the end of our sand trap. (Our lot doesn't perk well) The fountain was no more and the soil was getting progressively drier. The black is gone, and there is no more smell. The fairway is once again beautiful, and divots are once more acceptable. Hooray! We are just about to put in another shot of your bug stuff. What do you recommend? Another giant shock or just the monthly dose? We have a couple of slow sink drains, so we may put it in these instead of the toilets. “Guess what? I received the Bio-Safe Product last Friday 4/23 as promised. Remember I was desperate to get it by Friday Express Delivery... I was desperate!!! At 3pm I shocked my system, and said a prayer. "All my life, I had septic systems and never had any troubles... Then I put in a new system... at the end of 10 years, all of a sudden it wouldn't take water anymore... and fluid would not go out...Our house was full of sewage... it got so bad the toilet wouldn't flush. 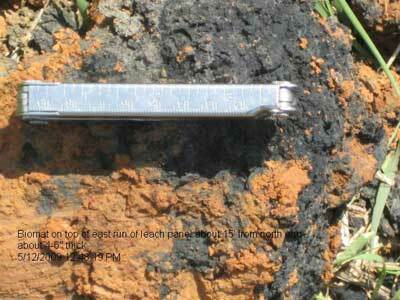 I dug it up and the walls inside the leach lines and trenches were covered with black scum... I thought for sure I'd have to tear down my leach lines and that additives such as yours were a waste of time and money, and not worth it...but now I m a believer. We bought a bunch of your Bio-Safe products and put it into the septic system and what do you know! It opened up and cleaned out the trenches and leach lines... It cleaned out the scum so it wouldn't go into the soil! It has been 15 years now and water has been moving out ever since." "Water was coming up like bubbles up through my lawn ...and the toilet wouldn't flush. I started pouring liquid and six bags of your product down into the toilet and within only three days... my system cleared and I've been using your products faithfully ever since." "I had my tank pumped two weeks ago and the next day there was seepage... The lateral lines had holes clogged real bad with dirt and scum... After flushing liquid and one bag once a week for eight weeks, Bio-Safe Septic completely reversed the clogging and seepage. I'm so lucky to have a friend recommend you." "I have one modern john in my house that is very temperamental and sluggish...Any time I used more than 3 sheets of paper, ...I had to use a plunger...I read your instructions favorably and put in a bag of boss. It gurgled and went down without my help. Ever since, my john has not gone into its old phase and is flushing properly. I can’t believe it’s a coincidence, since I had this problem for several years before I used Bio-Safe." "I always thought that products such as yours were a waste of time and money, until all of a sudden my septic system failed completely. “Hi Bill, Well we received the BioSafe and did what you said on shocking the system and so far everything is doing fine!!! “I just wanted to take a moment to write you about your products and our experience with them. We had our septic tank pumped out 3 times in the last 4 months to only find out that our drain field was not working at all. We were told by our local contractors that we would need a new drain field (very expensive, smelly and messy). Then we heard about your company and that you might be able to help. Well, I was very skeptical about the claims your website was making about fixing drain fields and septic systems. So I called your company and spoke with Chris, your technician, and he was very helpful and answered all of my questions and explained to me how your products worked and what they should be able to do for me and my drain field problems. After talking it over with my wife, we decided to give your products a try. We did not want to dig up our yard and deal with all the mess involved with a new drain field if we didn't have to. We purchased alot of buckets of Bio-112 and a 3 year supply of B.O.S.S. We followed the directions given to us and were totally amazed at what happened. We gave our system the initial shock treatment Chris told us about and were careful not to put the wrong items down the drain and not over use the drain field for a couple of weeks. After 3-4 weeks we decided to try out our septic system and drain field full blast. We did laundry, took showers, ran the dish washer and used the bathroom as we normally would. WE DID NOT HAVE ONE BACKUP OR ANY TROUBLE AT ALL!! We couldn't believe what was happening. The 30 year old drain field was working like new and there wasn't even a girgle coming out to the drains. THIS STUFF IS AMAZING AND IT WORKS AS STATED!! Once again, I would just like to say thank you for educating me about my septic system and drain field and providing products that fix the problem as you advertise. I am a true believer of your products and endorse them fully!! “When we moved into our house in June of 2004 we had no idea we'd inherited a broken septic system. By September 2004 we were experiencing backing up and clogging many times a week. We couldn't use the bathroom or take a shower without first checking the overflow pipe to see if it was showing signs of a backup. Eventually I learned how to tell if the pipe had backed up water in it by hitting the top of the overflow pipe with a wrench - the sound of the "clank" was different if there was standing water in the pipe. Initially we cleared the clogs by putting an attachment on a hose that expands when the water is turned on - it's called a Drain King - we snaked the hose with the Drain King attached to the end down the overflow pipe and turned the water on. The Drain King expands to seal the pipe and shoots a high pressure stream of water forward to build up pressure forcing the clog to clear. In the middle of September 2004 we hired a professional septic company to evaluate the septic system. They pumped out the tank, cleaned it, and applied a shock treatment of CCLS to the leach field. The representative said if this doesn't fix the problem, we'd have to install a new leach field and it would cost fifteen thousand dollars or more. After pumping, we followed the septic company's directions religiously, putting CCLS (the product they recommended) in the toilets every month. The clogs and backups stopped for about nine or ten months - well we did have a clog or a backup once in while - but just about the time we stopped expecting them, they started occurring again. By November 2005 we started experiencing clogs once a week until we were back to two or three times a week. We were terribly disappointed and didn't have the ability to raise tens of thousands of dollars to replace the septic. As I used the Internet to learn more about septic systems, I stumbled across the Bio-Safe One web site. At first, I didn't believe the hyperbole on the site and Bio-One Safe is expensive. Other product's websites pretty much said the same thing and their products were not quite as expensive. However, by February, 2006 I was getting desperate for a solution and over the objections from friends and family, spent a thousand dollars for Bio-Safe One – 5 gallon cans of liquid and a three year supply of powder. We applied this treatment in the middle of February 2006. During the next month we continued to experience the same frequency of backups and clogs, sometimes everyday. I became very aggressive with the powder - putting three bags a week in the toilets and then......suddenly.....the backups and clogs stopped.....I gradually reduced the number of bags to one bag every two weeks - which is the frequency I use now. As of this writing, April, 2007, we haven't had one backup or clog since March 2006, and we don't expect them anymore. Bio-Safe One is worth the cost and the effort. It rescued our 30 year old septic system and saved us tens of thousands of dollars. Wanted BIO-Safe to know, we are some 16 Months after the treatment and out septic system is still working well. If you will recall, due to my chlorine injection system on my water well failing, all my bacterial in my septic system had been killed and my leach field had completely quit taking liquid and the biomat had build up to a thickness of 6 inches all around my leach panels see photo. As you suggested, we injected a diluted container of Bio-112 into each run of the leach panels and in about 10 days, our leach field was working again. We continue to use Bio-safe granules monthly to maintain the system. We have not, nor do we intend to put our water softener back in service, as I am sure that was part of the problem. We will not hesitate to recommend Bio-safe products should the occasion arise.